Professors Patrick Mulvihill, D.Ed., and Elaine Luther, D.Sc., were so impressed with the business plan Kylie Archibeque, Faith Boyes, Katlin McArdle and Megan Paez presented in their Introduction to Business course that they encouraged them to pitch it at Shark Tank’s open casting call March 28. 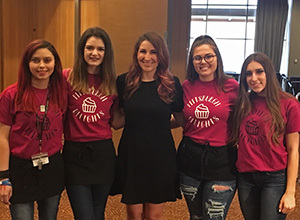 The business idea proposed was Pittsburgh Delights, a 24-hour community bakery bringing individuals together to celebrate great food, diversity and philanthropy with a portion of all sales going to charities supporting the Pittsburgh region. “This started as a class project, but it ended up turning into something that we all want to do in the future. It was amazing to have the opportunity to pitch our business idea to Shark Tank,” said Archibeque, a freshman business management major and graduate of Sylvania Northview High School in Toledo, Ohio. 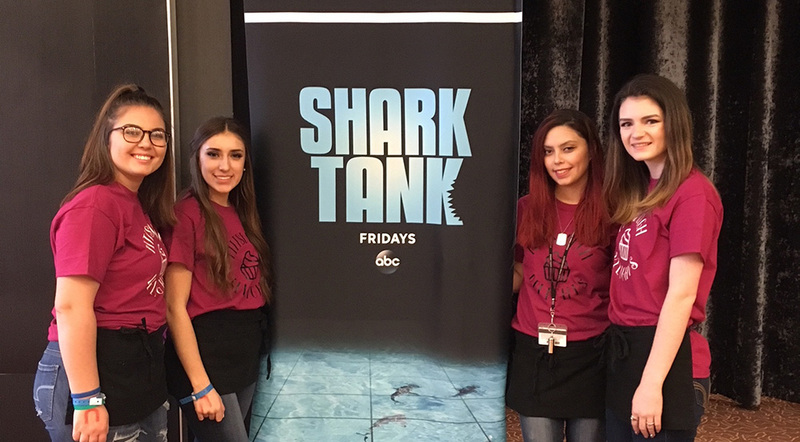 Shark Tank is the Emmy winning, business-themed reality show that searches throughout the nation for entrepreneurs to invest in who have the best business and product ideas. “I was impressed because their idea reflected the meal kit industry trend of cooking and making food as a group or a family and not just eating it. The group had a good presentation, matching outfits that reflected their business idea and a community service component to their plan,” Luther said. One of the aspects that made the students’ business plan unique was the idea of having a giving wall in the bakery. “The giving wall would be an opportunity to encourage others to give back and pay for someone else’s food, creating a sense of community within the bakery,” explained Paez, a freshman business management student and graduate of Brashear High School in Pittsburgh, Pa.
“Though there are many notable bakeries throughout the region, their business idea provided the additional physical space for people to come together to celebrate diversity through time tested, newly created delights. This celebrates the ethos of Pittsburgh and its many communities,” Mulvihill said. "We could not be prouder of this group!" he added. At the casting call, the students got to talk with Simple Sugars CEO and Founder Lani Lazzari, who was featured on season four of Shark Tank. “Experiences like this begin to put me in the mindset of what it will be like to work in the real world. The business industry is very competitive, but I now have a clearer idea of what I need to do to go far and reach my goals,” Paez said. The group will find out within the next few weeks from Shark Tank producers if they made it to the next round.